The Allied invasion of Sicily was code-named Operation Husky. It was a major battle of World War II. The Allies captured Sicily from the Axis Powers (Italy and Nazi Germany). It was a big sea and air operation, followed by six weeks of land fighting. It started the Italian Campaign. It was followed by the Allied invasion of Italy. Husky began on the night of 9–10 July 1943, and ended 17 August. Husky achieved the goals of the Allies. The Allies removed Axis air, land and naval forces from the island. As well, the Mediterranean's sea lanes were opened to the Allies, and Italian dictator Benito Mussolini was briefly removed from power. The plan for Operation Husky called for the sea attack of the island by two armies. One would land on the South Eastern coast. Another would land on the central Southern Coast. The attack would be helped by naval gunfire and bombing. The commander was the American General Dwight D. Eisenhower. The Allied land forces were from the American, British and Canadian armies. They were put into two groups. The Eastern Task Force was led by General Bernard Montgomery. The Western Task Force was commanded by Lieutenant General George S. Patton. In addition to the sea landings, airborne troops were to be flown in. They would capture bridges and high ground. The Allied naval forces were put into two groups to transport the invading armies. The island was defended by the two corps of Italian 6th Army under General Alfredo Guzzoni. In early July the total Axis force in Sicily was about 200,000 Italian and 32,000 German troops, and 30,000 Luftwaffe ground staff. By late July there were 70,000 German troops. The attack plan was made on 17 May. At the Casablanca Conference in January 1943, political leaders and the military leaders of the US and Britain met to discuss future plans. The British wanted an invasion of Sicily. General Eisenhower was made Commander-in-Chief of the Allied Forces. Once the Axis forces had been defeated in Tunisia, the Allied bombers attacked the airfields of Sardinia, Sicily and southern Italy. They also bombed industrial targets in southern Italy and the ports of Naples, Messina, Palermo and Cagliari. To distract the Axis, the Allies did several trick operations. The most famous was Operation Mincemeat. The British allowed a corpse disguised as a British officer to drift ashore in Spain, carrying a briefcase with fake secret documents. These stated that the Allies were planning to invade Greece and Sardinia, and had no plans to invade Sicily. The Germans thought the documents were real. The Germans moved much of their defences from Sicily to Greece. 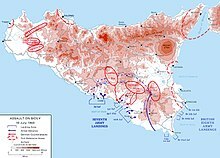 Map of allied movements on Sicily during the month of July. Two British and two American attacks by airborne forces were done on the night of 9–10 July. They wanted to capture the bridge over the River Anape. Airborne troops attacked patrols. A platoon captured Ponte Grande and fought off attacks. The strong winds made the sea landings hard. Landings were made on 10 July on twenty-six main beaches. By the evening of 10 July the seven Allied divisions were ashore and the port of Syracuse had been captured. Alexander's plan was to establish his forces on a line between Licata in and Catania. He wanted to capture ports. ↑ Murray, Stuart A.P. (March 1, 2005). ""Operation Husky" and the Italian Campaign". Atlas of American Military History. Facts on File. p. 168. ISBN 978-0816062218. ↑ Dickson, Keith D. (October 15, 2001). World War II for Dummies. For Dummies. p. 201. ISBN 978-5555060265 Check |isbn= value: checksum (help). ↑ Molony, Brigadier C.J.C. (1973). The Mediterranean and Middle East Volume V: The Campaign in Sicily 1943 and the Campaign in Italy 3rd September 1943 to 31st March 1944. Her Majesty’s Stationery Office. p. 122. ASIN B0016LQN3K. ↑ Molony, Brigadier C.J.C. (1973). The Mediterranean and Middle East Volume V: The Campaign in Sicily 1943 and the Campaign in Italy 3rd September 1943 to 31st March 1944. Her Majesty’s Stationery Office. p. 60. ASIN B0016LQN3K. This page was last changed on 26 December 2018, at 00:24.